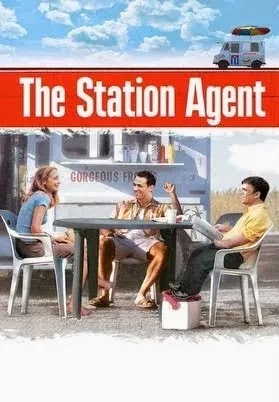 Before he was famous for playing Tyrion Lannister in Game of Thrones, Peter Dinklage was the lead in The Station Agent. A touching indie film about loneliness, and depression, but more importantly friendship. Fin (Peter Dinklage) is a loner, a man of very few words, who works at a model train store in Hoboken. We understand that his only friend is the owner of the store. But when the owner passes away, his will states that the train store will be sold. The owner also bequeathed an old train depot out in Newfoundland, New Jersey to Fin. But the lawyer warns him that there's nothing out there in that area, which turns out to be exactly what he wants. Much of the film is told from Fin's perspective, which allows us to empathize with him. The film deals a little with dwarfism, and how cruel people can be. As such, Fin usually doesn't have good experiences around people. They laugh and make jokes. He goes to the train depot seeking isolation, yet can't seem to be alone there. He seems to inadvertently make friends all over town. He meets Joe (Bobby Cannavale), who runs a nearby food truck. 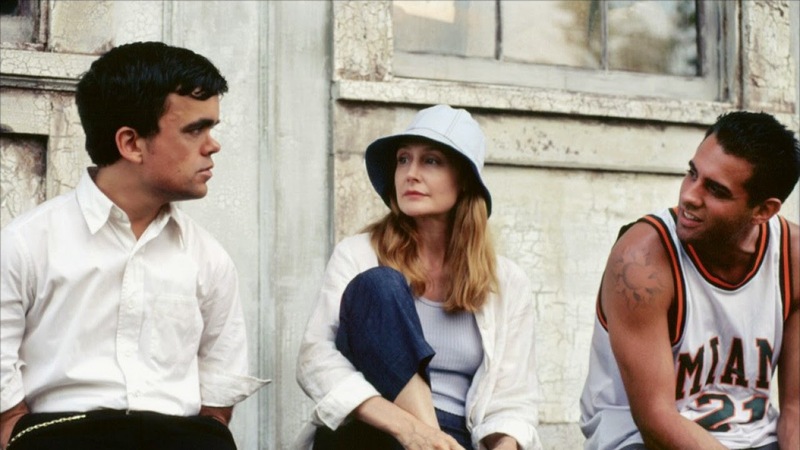 He also has a few comical run-ins with Olivia (Patricia Clarkson), before Joe, in all his eagerness to make friends, keeps creating opportunities for them all to hangout. At its heart, the film is about these three people dealing with loneliness in their own different ways and how they end up something of a support group for each other. Olivia is a divorced painter, still struggling with the breakup and the loss of her child. Joe is taking care of the food truck while his father is sick in the hospital. The three of them bond over "walking the right of way," which Fin, in his love of trains, introduces them to. And Joe, the groups cook, makes them a few dinners as well. Joe irritates Fin at first, by continually invading his solitude, but he's so likable, in his friendly exuberance it's hard not to smile when he's on screen. However, by the time Fin starts opening himself up to these people, various circumstances cause them to shut him out. But in the meantime he befriends Emily (Michelle Williams), a young librarian who's recently learned she's pregnant. Her family disapproves, and her boyfriend is becoming more and more of a jerk. She finds Fin's disarming personality soothing. And for once in his life, Fin finds being with people comforting. Despite his search for isolation, it turns out as long as he's in this small town, he'll never be lonely. And he starts to find that it suits him just fine. At its darkest, it deals with depression and isolation, but these things take a while to show up, and quickly turn to brighter moments of friendship. Granted this film came out way back in 2003, and I'm just getting to it (it's streaming on both Netflix and Amazon Prime), but this is one of the more pleasant indie films I've seen in years. There's a satisfying serenity to the small moments when the three are together on screen, and it's all punctuated by the plucky ever pleasant soundtrack. It's a minimalist film about friendship that doesn't try too hard or do too much. It's a great example of how sometimes less is more.